Percona has a long tradition of performance investigation and benchmarking. Peter Zaitsev, CEO and Vadim Tkachenko, CTO, led their crew into a series of experiments with MySQL in this space. The discussion that always follows on the results achieved is well known and praised even by the PostgreSQL community. So when Avi joined the team and settled at Percona just enough to get acquainted with my colleagues, sure enough one of the first questions they asked him was: “did you know sysbench-tpcc also works with PostgreSQL now ?!“. sysbench is “a scriptable multi-threaded benchmark tool based on LuaJIT (…) most frequently used for database benchmarks“, created and maintained by Alexey Kopytov. It’s been around for a long time now and has been a main reference for MySQL benchmarking since its inception. One of the favorites of Netflix’ Brendan Gregg, we now know. 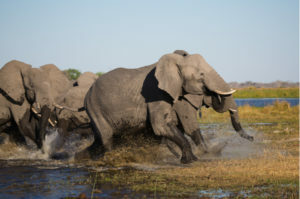 You may remember Sveta Smirnova and Alexander Korotkov’s report on their experiments in Millions of Queries per Second: PostgreSQL and MySQL’s Peaceful Battle at Today’s Demanding Workloads here. In fact, that post may serve as a nice prelude for the tests we want to show you today. It provides a good starting point as a MySQL vs PostgreSQL performance comparison. The idea behind Sveta and Alexander’s experiments was “to provide an honest comparison for the two popular RDBMSs“, MySQL and PostgreSQL, using “the same tool, under the same challenging workloads and using the same configuration parameters (where possible)“. Since neither pgbench nor sysbench would work effectively with MySQL and PostgreSQL for both writes and reads they attempted to port pgbench‘s workload as a sysbench benchmark. More recently, Vadim came up with an implementation of the famous TPC-C workload benchmark for sysbench, sysbench-tpcc. He has since published a series of tests using Percona Server and MySQL, and worked to make it compatible with PostgreSQL too. For real now, hence the request that awaited us. Our goal this time was less ambitious than Sveta and Alexander’s. 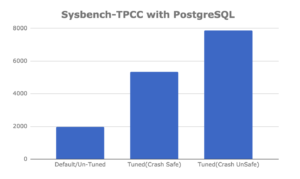 We wanted to show you how we setup PostgreSQL to perform optimally for sysbench-tpcc, highlighting the settings we tuned the most to accomplish this. We ran our tests on the same box used by Vadim in his recent experiments with Percona Server for MySQL and MySQL. Before we present our results we shall note there are several ways to speed up database performance. You may for example disable full_page_writes, which would make a server crash unsafe, and use a minimalistic wal_level mode, which would block replication capability. These would speed things up but at the expense of reliability, making the server inappropriate for production usage. Hence, we consider it to be an in-memory workload with the whole active data set in RAM. In this post we explain how we tuned our PostgreSQL Instance for an in-memory workload, as was the case here. We’ll discuss most of these parameters in the sections that follow, but we would like to highlight two of them here. We increased maintenance_work_mem to speed up index creation and max_wal_size to delay checkpointing further, but not too much — this is a write-intensive phase after all. Using these parameters it took us 33 minutes to complete the prepare stage compared with 55 minutes when using the default parameters. If you are not concerned about crash recovery or ACID, you could turn off full_page_writes, fsync and synchrnous_commit. That would speed up the data load much more. Having run a vacuum for the entire database we restarted PostgreSQL and cleared the OS cache before executing the benchmark in “run” mode. We repeated this process after each round. Defines the amount of memory PostgreSQL uses for shared memory buffers. It’s arguably its most important setting, often compared (for better or worse) to MySQL’s innodb_buffer_pool_size. The biggest difference, if we dare to compare shared_buffers to the Buffer Pool, is that InnoDB bypasses the OS cache to directly access (read and write) data in the underlying storage subsystem whereas PostgreSQL do not. Does this mean PostgreSQL does “double caching” by first loading data from disk into the OS cache to then make a copy of these pages into the shared_buffers area? Yes. Does this “double caching” makes PostgreSQL inferior to InnoDB and MySQL in terms of memory management? No. We’ll discuss why that is the case in a follow up blog post. For now it suffice to say the actual performance depends on the workload (mix of reads and writes), the size of the “hot data” (the portion of the dataset that is most accessed and modified) and how often checkpointing takes place. If you can fit the whole of your “hot data” in memory, then dedicating most of your memory to shared_buffers pays off nicely, making PostgreSQL behave as close to an in-memory database as possible. If the size of your “hot data” surpasses the amount of memory you have available in the server, then you’re probably better off working with a much smaller shared_buffers area and relying more on the OS cache. For this benchmark, considering the options we used, we found that dedicating 75% of all the available memory to shared_buffers is ideal. It is enough to fit the entire “hot data” and still leave sufficient memory for the OS to operate, handle connections and everything else. This setting defines the amount of memory that can be used by each query (not session) for internal sort operations (such as ORDER BY and DISTINCT), and hash tables (such as when doing hash-based aggregation). Beyond this, PostgreSQL moves the data into temporary disk files. The challenge is usually finding a good balance here. We want to avoid the use of temporary disk files, which slow down query completion and in turn may cause contention. But we don’t want to over-commit memory, which could even lead to OOM; working with high values for work_mem may be destructive when it is not really needed. We analyzed the workload produced by sysbench-tpcc and found with some surprise that work_mem doesn’t play a role here, considering the queries that were executed. So we kept the default value of 4MB. Please note that this is seldom the case in production workloads, so it is important to always keep an eye on that parameter. This setting stipulates the cost that a non-sequentially-fetched disk page would have, and directly affects the query planner’s decisions. Going with a conservative value is particularly important when using high latency storage, such as spinning disks. This wasn’t our case, hence we could afford to equalize random_page_cost to seq_page_cost. So, we set this parameter to 1 as well, down from the default value of 4. To set up streaming replication wal_level needs to be set to at least “replica” and archive_mode must be enabled. This means the amount of WAL data produced increases significantly compared to when using default settings for these parameters, which in turn impacts IO. However, we considered these with a production environment in mind. For this workload, we observed total WALs produced of size 3359 GB with wal_compression disabled and 1962 GB with wal_compression. We enabled wal_compression to reduce IO — the amount (and, most importantly, the rate) of WAL files being written to disk — at the expense of some additional CPU cycles. This proved to be very effective in our case as we had a surplus of CPU available. We set the checkpoint_timeout to 1 hour and checkpoint_completion_target to 0.9. This means a checkpoint is forced every 1 hour and it has 90% of the time before the next checkpoint to spread the writes. However, a checkpoint is also forced when max_wal_size of WAL’s have been generated. With these parameters for a sysbench-tpcc workload, we saw that there were 3 to 4 checkpoints every 1 hour. This is especially because of the amount of WALs being generated. In production environments we would always recommend you perform a manual CHECKPOINT before shutting down PostgreSQL in order to allow for a faster restart (recovery) time. In this context, issuing a manual CHECKPOINT took us between 1 and 2 minutes, after which we were able to restart PostgreSQL in just about 4 seconds. Please note that in our testing environment, taking time to restart PostgreSQL was not a concern, so working with this checkpoint rate benefited us. However, if you cannot afford a couple of minutes for crash recovery it is always suggested to force checkpointing to take place more often, even at the cost of some degraded performance. We set all of these parameters to ON to satisfy ACID properties. We enabled autovacuum and other vacuum settings to ensure vacuum is being performed in the backend. We will discuss the importance of maintaining autovacuum enabled in a production environment, as well as the danger of doing otherwise, in a separate post. Before we start to discuss the numbers it is important to highlight that we enabled wal_compression before starting sysbench. As we mentioned above, the amount of WALs generated with wal_compression set to OFF was more than twice the amount of WALs generated when having compression enabled. We observed that enabling wal_compression resulted in an increase in TPS of 21%. No wonder, the production of WALs has an important impact on IO: so much so that it is very common to find PostgreSQL servers with a dedicated storage for WALs only. Thus, it is important to highlight the fact wal_compression may benefit write-intensive workloads by sparing IO at the expense of additional CPU usage. 1962 GB of WALs is a fairly big amount of transaction logs produced over 10 hours, considering we had enabled wal_compression . We contemplated making use of a separate disk to store WALs to find out by how much more a dedicated storage for transaction logs would benefit overall performance. However, we wanted to keep using the same hardware Vadim had used for his previous tests, so decided against this. Setting full_page_writes, fsync and synchronous_commit to OFF may speed up the performance but it is always crash unsafe unless we have enough backup in place to consider these needs. For example, if you are using a COW FileSystem with Journaling, you may be fine with full_page_writes set to OFF. This may not be true 100% of the time though. However, we still want to share the results with the crash unsafe parameters mentioned in the paragraph above as a reference. Did we expect to get these numbers? Yes and no. Certainly we expected a properly tuned server would outperform one running with default settings considerably but we can’t say we expected it to be almost three times better (2.899). With PostgreSQL making use of the OS cache it is not always the case that tuning shared_buffers in particular will make such a dramatic difference. By comparison, tuning MySQL’s InnoDB Buffer Pool almost always makes a difference. For PostgreSQL high performance it depends on the workload. In this case for sysbench-tpcc benchmarks, tuning shared_buffers definitely makes a difference. On the other hand experiencing an additional order of magnitude faster (4x), when using crash unsafe settings, was not much of a surprise. What did you think about this experiment? Please let us know in the comments section below and let’s get the conversation going. PostgreSQL is known for its data integrity and its ability to be customized via extensions. Those are some of the reasons it is one of the most popular database options in the world. However, MongoDB is the fastest growing database technology today. It’s easy to adopt and deploy and it’s as flexible as it is powerful, which is why developers have a strong preference for it. For more information on why developers prefer MongoDB, download our white paper. For a comparison of PostgreSQL, MongoDB and MySQL, download: How Do I Know Which Database to Choose? And while the insert benchmark doesn’t support Postgres, I assume the changes would be trivial. Thank You Mark. We would surely look into Linkbench.